With the passing of the Scion brand comes the all-new 2017 Toyota 86 in Evansville, which replaces the outgoing FR-S sports coupe. Featuring a slew of new enhancements, the 86 is sure to turn heads. 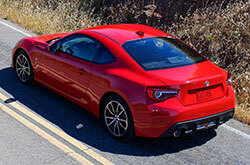 The new 86 comes packed with plenty of high-tech features that you're sure to appreciate and love. Standard features include 17-inch alloy wheels, aluminum pedals and scuff plates, LED taillights, a very easy-to-read 7-inch touchscreen, voice activation, a USB port, HD radio and a concert-like Pioneer audio system. On top of these benefits, the car comes with creature comfort conveniences like a six-way driver seat and a four-way passenger seat that will help you relax. In addition, a steering wheel with integrated audio controls and silver stitching give this coupe superb style as noted by various 2017 Toyota 86 reviews. A 2.0-liter flat-four engine powers the 2017 Toyota 86 in Evansville. The new powerplant boosts power by 5 horsepower to 205 horsepower and increases torque to 156 pound-feet, which is 5 pound-feet more than the old engine. You can choose between either a six-speed manual or a six-speed automatic transmission with paddle shifters. 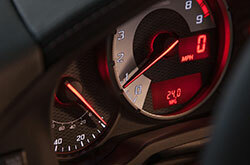 Gear shifters for the manual have been enhanced for improved performance. Additionally, Toyota has also upgraded the car's suspension to make the sports coupe more agile, giving the driver better overall control. Various standard features are now offered on the Toyota 86, including six airbags, antilock brakes, and stability and traction control, as well as a rearview camera, for improved safety. For more safety features, Lane Keep Assist and Blind-Spot Monitoring can be had as optional equipment. 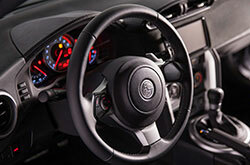 Gather All the Latest Info on the Toyota 86! 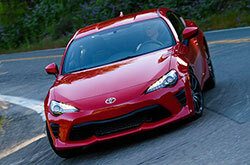 If you live in the Evansville area and have been interested in a new car like the 2017 Kia Optima, Hyundai Genesis Coupe, Subaru BRZ and the Mazda MX-5 Miata, we recommend you take a hard look at the 2017 Toyota 86. You could end up fancying its great in-car technologies and polished styling among other qualities. Once you've obtained the details you want for the 2017 Toyota 86, browse our site to find information about great lease incentives from Kenny Kent Toyota. 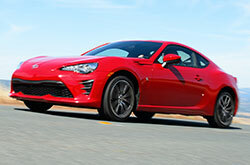 Desire a Toyota 86 and looking for cost-effective incentives? Then visit us next time you're in the area! We hope the specs in our 2017 Toyota 86 review will be valuable when you make your ultimate purchase decision. Get ready to be amazed with the brand-new Toyota 86 for sale in Evansville, IN. Call to schedule an appointment for a showing. Look at our video recording to take a peek at its dapper interior before your visit.